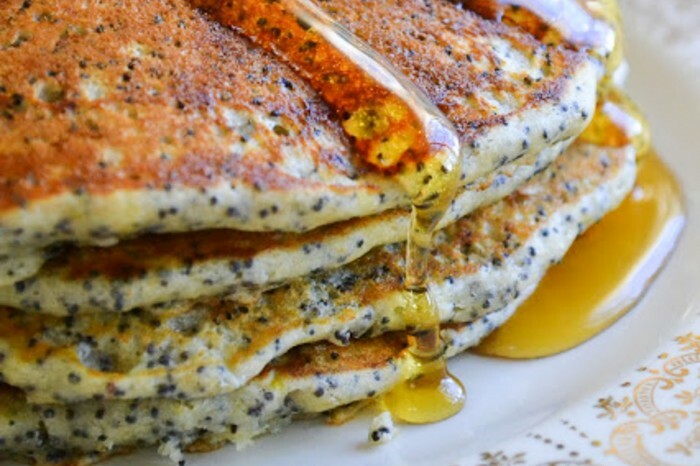 Lemon Poppy Seed Pancakes ~ This unexpected combination is a refreshing change from regular pancakes and it’s perfect for a special occasion, a cozy weekend morning, or just any time you want to treat yourself! And it’s the same thing with poppy seeds. People seems to think that a tablespoon or two entitles them to emblazon the words poppy seeds all over their recipe title. I assure you that these pancakes have earned their name fair and square. 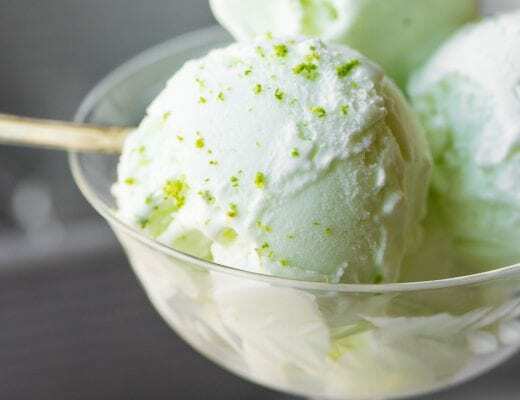 Lots of lemon flavor, lots of poppy seed crunch. And in case you’re wondering, yes, maple syrup does go with the lemon, in fact the flavors complement each other beautifully. If you’re a fan of the delicate crunch that poppy seeds bring to a recipe, you’ve come to the right place. I’ve used them in lots of delicious ways, from a basic LEMON POPPY SEED DRESSING and POPPY SEED MAYONNAISE to ALMOND POPPY SEED FRENCH TOAST and even AMARETTO POPPY SEED ICE CREAM! 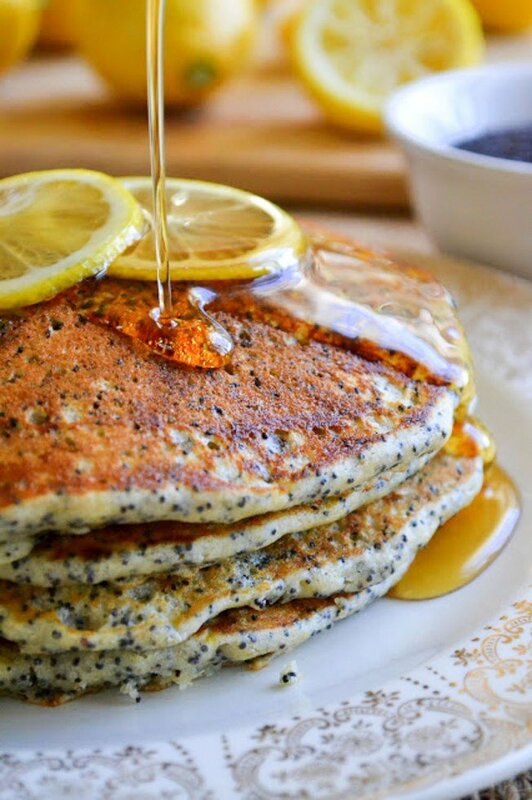 Lemon Poppy Seed Pancakes ~ This unexpected combination is a refreshing change from regular pancakes and it's perfect for a special occasion, a cozy weekend morning, or just any time you want to treat yourself! In a separate bowl, blend the wet ingredients together and fold in the poppy seeds. Add the wet to the dry and mix just until combined, don't over mix, you want your pancakes to be fluffy! Lumps are fine. Cook on a lightly greased griddle until lightly golden on both sides. You might try another citrus fruit like orange or tangerine, that’s up next for me, so stay tuned! 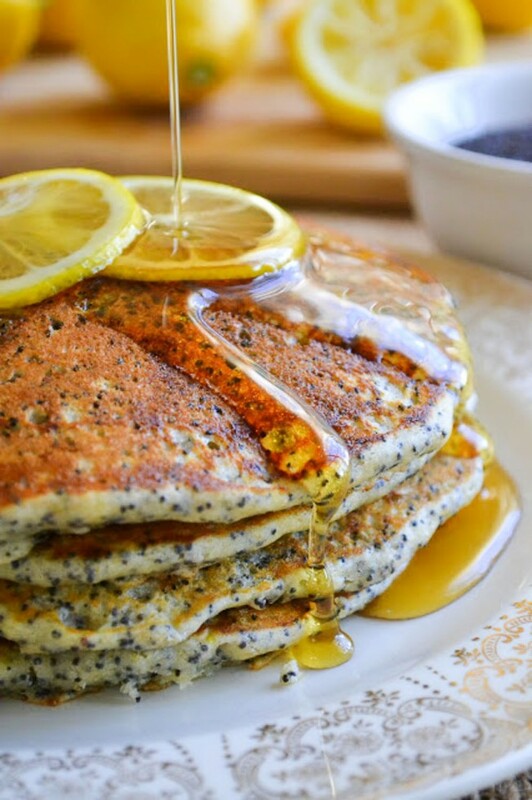 Thanks for pinning these Lemon Poppy Seed Pancakes! If I don’t have whole wheat flour, can I just use 1 cup all-purpose instead? This recipe looks so good and I would love to make these pancakes this weekend. However as poppy seeds are banned in my country, what can I use as a substitute? Thanks! I don’t know where Adeline lives, but I’m a Dallas girl living in Singapore and poppy seeds are not allowed here. It’s due to the history of opium abuse. I doubt poppy seeds sold for consumption can actually be used to grow poppy flowers, but that’s the reason. We use black sesame seeds as a substitute. Different taste but not a bad substitute. Love your site. Just printed out this recipe and will try very soon. I’ll report back. Thanks Jeanne, that’s so interesting! I have made these for Mother’s Day the past couple years and they are always a huge hit! My mom LOVES them as do I. The first time I made them we were out of our homemade maple syrup so I made up some buttermilk syrup. Oooh man, that was a game changer. We can’t have them any other way now! And now we put strawberries on top as well! They are a very special treat for us every year, so thank you for sharing! We love them!! Thanks so much Natalie, I’m so intrigued by the buttermilk syrup, I’ve never had it, can you share your recipe? And I’ve been meaning to make these with strawberries, I need to try that! Hi! I want to make these gluten-free. I can easily swap out the regular flour, but wheat flour tends to be heavier. Any suggestions on a swap-out for the wheat flour? Thanks! I think in this case I would go for the gluten free baking mix or flour substitute of your choice Kirsten, and not worry about adding in a different element. For those asking, I made 7 large pancakes out of the batter. LOVE these pancakes…AND I didn’t change a thing! ?? Help! Pre mixed the batter for mothers day brunch tomorrow and there is a horrible bitter after taste. Can my batter be saved? ? It’s obviously too late now, but I made these yesterday and was really concerned by the bitter taste of the batter. Once they cooked though, it all disappeared and they were gorgeously lemon flavored with no bitter notes at all. My husband flipped for them. These are amazing! My husband and I love them but can you tell us the serving size/amount of servings since we like to track our calories/macros in an app. 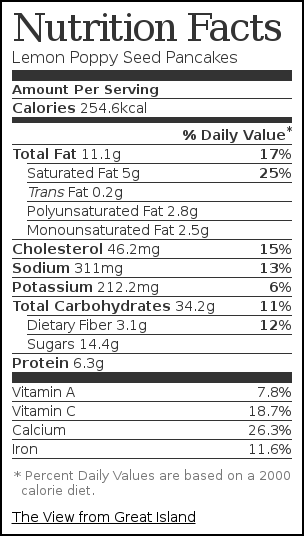 Not knowing serving size and amount of servings (even approximate) makes it difficult. THANK YOU!!!! We’d love to republish your FABULOUS recipe in Minnesota Parent and Minnesota Good Age magazines! Would you be willing to give us permission and to send us high-res photos of the recipe? We can attribute the recipe to your blog! I have made this recipe twice now. I have a dairy allergy so I used almond milk and 1/2 each of large rime and coconut oil instead of the butter. They are fabulous!!! So good. Yum yum yum! We have a boysenberry syrup from Maple Grove Farms that pairs so beautifully with the pancakes. I cannot get enough of them. I have a two year old daughter who lives to help me cook and she adores making these with me so it doubles as a fun family activity as well. Thank you for such a delicious and fun recipe! Doing a bit of an experiment with this recipe today. Pre-made the batter and packed it in the cooler to transport to a vacation cottage to be made tomorrow morning. The batter looked nice and thick and fluffy, so hoping it holds up! Funny thing, I forgot to add the butter. Also I substituted almond flour for the wheat flour and I used just less than a 1/4 C of poppy seeds (still should use a little less). Had no problems with the cakes cooking on low heat (about 260 on the griddle). My family loved them as well as my teen-aged daughter’s friends. Me not so much. I agree with you Mindy. They were very thin. And I didn’t even add all the wet ingredients since it was looking thin. I also used powdered buttermilk and all A-P flour. And I only used 1 tablespoon poppy seeds, since 1/4 cup seemed like an awful lot. Next time, I will add 1/4 cup more flour and 1/4 cup less buttermilk. These sound SO good! I love lemon poppy seed muffins, so why not make pancakes! How many does this make/serve? Brilliant! You are a culinary genius! Thanks Staci — you’ve just made my day! Yummy, easy pancakes. A bit too much poppy seed in my opinion, next time I will only add 1/4 cup or even less. Did not enjoy, perhaps it was the buttermilk. OMG I can’t believe how good these are. Saw it, made it eating it now. Can’t understand why some people did not have success. I substituted soy milk for buttermilk and olive oil for butter. Will definitely be sharing this one with friends. Thankyou. I wonder if you have substitute the exact amount of milk and oil? I would like to substitute it with these ingredients, as I do not want to buy a carton of buttermilk for one recipes and I don’t want to use butter as much in my diet. Epic fail. My pancakes were not fluffy at all and pretty much never cooked. They were so thin and and still didn’t cook in the middle! The flavor was good though. So sad. Followed the recipe exactly for less-than-awesome results. Pancakes refused to cook all the way through, no matter how much extra liquid I tried to add. Raw pancakes left the family with stomach aches. Too many poppyseeds, make the pancaked bitter. Who are you???? OMgoosh I stumbled onto your PINTEREST recipe then boards ans YUM, its everything that I love!!! I can’t wait to peruse your BLOG if its as goo as your PINS well then, I am in for some interesting reading, creating, tasting etc.!! You go girl :) Have a super day! I’m loving these pancakes! That golden color and texture looks like perfection. Pinned to make over the weekend! I’m glad I inspired you — I was surprised at how much I liked the lemon with the maple! Oh, I want to try this! I love pancakes, and I’m always looking for something new. We had this for dinner tonight. My six year old ate six! The first batch I made I thought were a little thick. I added some water to the others. I also decreased the poppy seeds to 2tbsp. Still plenty to get the fun poppy seed crunch! Fun recipe! Mouthwatering, lovely, alluring – and I shared it on Facebook (together with the other authors) and am impatient to try it on Easter. Thank you! Ahhhh, I attempted to make these at midnight and they were just a fail. Non-baking enthusiasts should note that wheat flour and white flour cannot be replaced 1:1. I used all white flour, as that is what I had available, and my batter turned out very runny. The pancakes simply would not cook through. I ended up stirring in heaping tablespoons of flour between batches on the griddle until they finally came to a decent consistency. Hopefully I can try this recipe again with the appropriate wheat flour…when I can afford another jar of poppy-seeds! We have several stores that sell poppy seeds in bulk. Makes it more affordable. Check the stores in your area. 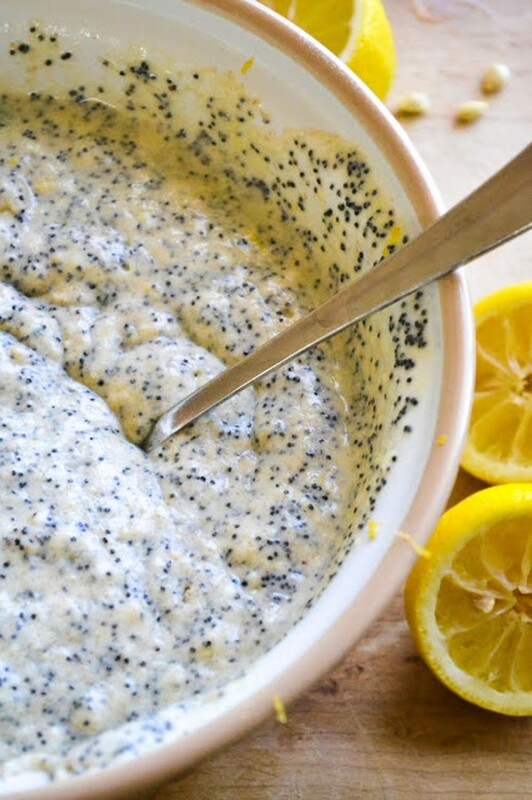 if i’m going to eat something making use of the lemon-poppy seed combination, it’s going to be this. how enticing!! never tried lemon poppyseed this way. 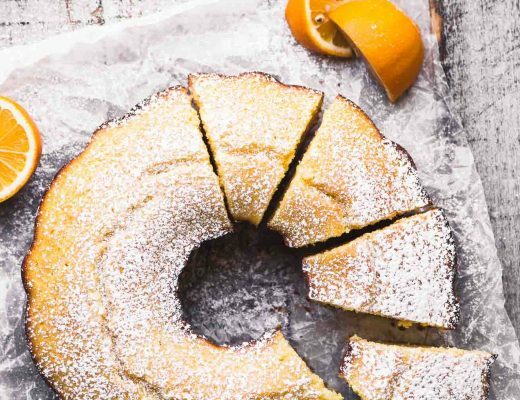 They look yummy and seem to have enough lemon and poppy seeds – you did good! I think you only made me want more too – very nice Sue! I had pancakes for breakfast and I STILL want these so badly right now. They really look fabulous! I wish I had seen this before breakfast this morning. They are perfect for Sunday brunch. Lovely! These are downright gorgeous. I never make pancakes, but why not? I’m going to bookmark these to try one weekend day this spring. How delicious! I wish I was sitting at your breakfast table right now, it’s snowing – again, and it looks like you’ve made the perfect winter’s morning meal! Did you have fun with your citrus week? I really enjoyed your theme! I’m really glad you enjoyed the week, I had so much fun! I think I may try it with other themes; it’s useful to stock up on ingredients and so satisfying to be able to really delve into the subject. It’s gotten to the point that, even if I wanted to, I can’t imagine making a plain pancake anymore, there are too many varieties to explore! Amazing! I love everything about these! I would eat these for breakfast, lunch and dinner! Oh, I have a weakness for dinner pancakes! Hello! I recently just started a youtube Korean food channel, EasyKoreanFood, where you can learn how to make fast & easy Korean food! It would mean the world to me if you could check it out because I’m just starting out! Thanks! mmmmmmmmm….if they taste half as good as they look! These pancakes have a bright lemony flavor—and the maple syrup really is good along with the lemon—who knew? Wish I had these for my breakfast! Awesome pics!! These are brilliant, Sue! You can make breakfast for me any day. Gorgeous photos as always too. These would certainly feed that lemon addiction of mine.